As the name implies, filters can “filter out” certain types of contamination. They essentially clean the hydraulic fluid as it flows through them. 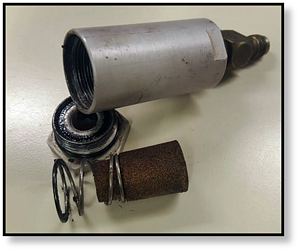 If a component in the hydraulic system suffers a catastrophic failure, it will usually introduce contamination into the system. The filters help keep that contamination fairly localized to one area. In a hydraulic system, there are pressure filters, which are located on pressurized lines (like those between the pump and the hydraulic motor), and low-pressure (aka, return line) filters. 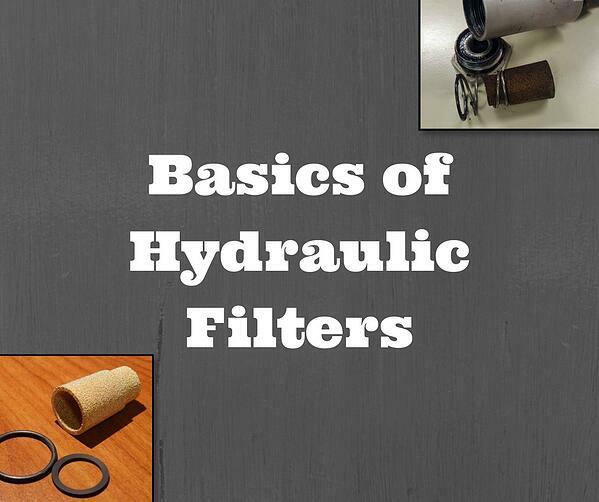 Aside from that basic classification, there are several different types of hydraulic filters. Screen filters are what their name implies: a screen made of tightly woven wires. The weave on these wires creates a specified pore size. The pore size controls what size of particles the filter can trap. An example of a screen filter would be the suction strainer on reservoir pump outlets. Suction strainers have a relatively coarse mesh designed to filter out coarser contaminants. Inline cartridge filters and spin-on filters have a filtering cartridge that can be replaced when it gets clogged. Spin-on filters usually found on low-pressure return lines while the inline cartridge filters can be found both on both pressure and return lines. These are probably the most common type of filter found on compact and heavy equipment. With a bag filter, hydraulic fluid is forced through a cloth bag. Solid contaminants, like rust, dirt, metal particles, etc., get trapped within the bag. These are usually limited to applications that involve a large volume of fluid and aren’t commonly found on heavy equipment. Most of these filters are contained in plastic, steel, or aluminum housings. The type of housing primarily depends on the pressure levels involved. That’s why you would see plastic or aluminum housings for filters on low-pressure return lines. Case drain filters, which are low pressure return line filters, have aluminum housings, for example. "Particles that cause problems in high performing, high pressure hydraulic systems are in the range of approximately 5 to 15 [microns]." That is much, much smaller than a human hair, and likely not visible to the naked eye. And those are the types of particles that hydraulic filters do an excellent job of filtering out of your fluid. Another key metric for a filter is the beta ꞵ ratio. The best way to explain the beta ꞵ ratio is with an example: a filter with a beta ꞵ ratio of 100 means that for every 100 particles that are entering upstream of the filter on one particle will make it through the filter. Of course, the beta ꞵ ratio doesn’t mean anything without the micron rating. If you have a 6 micron filter, you would see the values combined as β6 ≥ 100. That means the filter is rated for 6 microns, greater than or equal to beta ꞵ 100. Out of 100 upstream particles that are 6 microns or greater in diameter, only one of those particles would make it through the filter. The efficiency rating for a filter is given by (ꞵ - 1)/ꞵ x 100%. The higher the beta ratio, the more efficient the filter. Quality hydraulic filters may seem expensive, but keep in mind that cheap filters are usually so inexpensive for a reason. Cheap filters can do more harm than good. Think of filters as an investment in the life and health of your hydraulic system, and make a wise investment! Hydraulic filters are an essential part of your hydraulic system. That's why we encourage you to check and change them according to manufacturer's guidelines. We also want to encourage you to invest in quality filters for your machine.